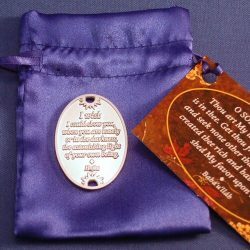 We sometimes include these satin pouches with pendant and chain orders, but if you want to make sure you get one (especially if you are only ordering a pendant without a chain) then order it here. It is 2×2.5″ – just big enough for a pendant or pendant and chain. We have them in black, maroon, gold and silver.